Leave from Kuta at 23.00 a.m. to Pasar Agung. It takes 1½ hours. Leave from Pasar Agung at 01.30 a.m. up to the top of Mt. Agung. It takes 3 ½ to 4 hours at a normal condition. We climb in the darkness to get to the top. There are 3 trek points go to the top. We walk past a tropical forest which takes 1½ hour. It is a pretty steep trail. You have to be ready with this hard start. This trek is normally covered in 1 hours and still pass tropical plantation. Here, similar to the first trek, you will walk pass a pretty steep trail with loose volcanic sand and stone. This is a more challenging trek . It takes about 1½ hour or less depending on your spirit and condition. It’s a great trip. You have to creep and use your two hands to help your moving. Don’t try to stand upright. You’ll walk along the stone and sediment of lava that become as hard as the stone itself. 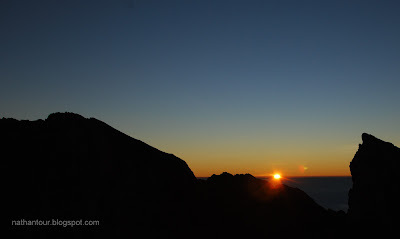 When arriving on the summit overlooking to the east is a spectacular view of the sunrise and Mt. Rinjani. If we look on the west side there appears the view of Mt. Batu Karu, one of the holiest mountains in Bali Island. After making some pictures of sunrise we go down to Buffalo Stone for Breakfast. Here, we enjoy an aerial view of the temple while enjoying breakfast with Our Staff. Changing clothes, trekking shoes, sun lotion, sweater, rain coat, and hat. Click Here for Booking!